WonderCon: Pixar's Wall-E Presentation - Incredible! One half Disney's panel today at WonderCon in San Francisco was a presentation focused on Pixar's Wall-E (the other half was Prince Caspian). Now everyone knows that I'm truly excited for this movie, as it combines my love for sci-fi and my love for Pixar, and that can only mean great things. However, after this presentation today, I'm completely sold - Wall-E is going to be the best movie of 2008. Not only looking at the passion that the director is bringing to it, but also looking at the footage we saw, I know it already. I laughed, I cried (I'm serious), and I smiled, and by the end of the Disney panel, I was in love with Wall-E. Finding Nemo director Andrew Stanton stopped by to talk about his inspirations and the filmmaking process to a crowd of comic book fanatics. The idea for Wall-E is simple: what if mankind decided to leave the Earth and forgot to turn off the last robot. Wall-E, after hundreds of years, is the last remaining robot of the many that were sent to Earth to clean up the planet. 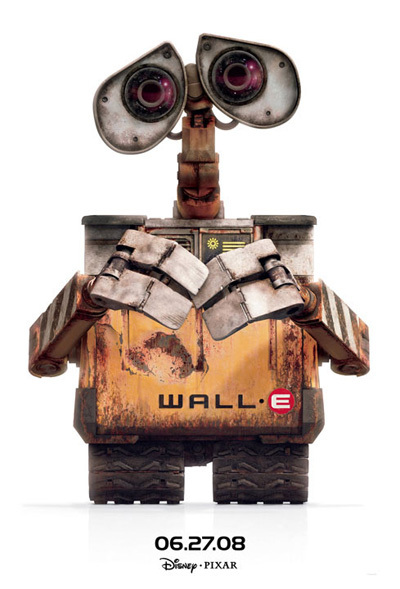 Wall-E has never met anyone else and has no friends and is just working alone day-to-day. That's the premise for the movie before Eve, a modern robot made by the Buy-N-Large Corporation, finally lands to investigate the planet (for another unknown reason). Wall-E isn't an action movie or a sci-fi flick, it's really just a simple love story. Let's just get down to it. We were shown four different clips from Wall-E and each of them was more amazing than the last. The first clip was a typical day at work for Wall-E. It shows a lot of the same footage from the trailer where Wall-E plays with the paddle ball racquet, fire extinguisher, and bra. It shows him putting together an entire football field of compacted cubes of trash. It also shows him collecting human items and throwing them into his lunch box that he takes back to his home, which is a big Buy-N-Large truck left over in the street. However, this isn't the last time we'll see that trusty fire extinguisher. 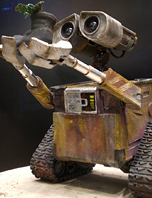 The second clip was of Wall-E showing Eve, the "female" robot, all of his collected items in his truck. He would show her something and she would usually end up breaking it by being curious, including a light bulb, a sheet of bubble wrap (that she entirely pops), a Rubiks cube, and more. He then turns on the TV and puts in a VHS tape that's playing a dance scene from Hello, Dolly!. He presumes to dance around the truck and teach her how to dance like in the clip. It's a lovely scene that shows the true emotions of each robot character. The third clip just might have been the best. It was an absolutely beautiful scene that had me in tears (I am completely serious) where Wall-E grabs onto the spaceship because Eve was being forced to go home and he doesn't want to lose the "only friend he has ever had." He grabs onto the side of it as it launches off and flies through space, going past the sun and the rings of Saturn and eventually coming to a big, dark nebula where the Axiom spaceship is located. The scenes of Wall-E flying through space evoked a similar visual poetry to 2001: A Space Odyssey, which is very rare. The score and music were an incredible addition that topped off one of the most emotional Pixar scenes I have ever watched. The last scene is after Wall-E has been on the ship for a while and Eve gets mad and is trying to kick him off and send him home to Earth. Wall-E doesn't want to go and turtles up into a box every time, but eventually another weird robot that was made of only a red beacon light floats in and tricks Wall-E into the pod. He puts a very cute old boot with a plant in it (concept sculpt pictured right) into the ship and Wall-E can't resist going to look at it. The escape pod is then launched and Eve goes chasing out after him. Wall-E uses a fire extinguisher to escape just in time before the entire thing self destructs. Another "cute" scene follows where he uses the exhaust from the extinguisher to boost himself back towards the ship while Eve is chasing out after him and there's a funny moment where he flies past her and eventually catches up to her using controlled bursts (with the extinguisher). Wall-E writer/director Andrew Stanton (who also directed A Bug's Life and Finding Nemo) started off by telling his story of why he wanted to make Wall-E. He starting by saying that he really missed the feel of the films from the golden age of sci-fi, like Blade Runner. Stanton wanted to combine that with his love of animation and bringing life to inanimate objects and thus the "juice" of Wall-E was born. He really wanted to capture the look and feel of the 70mm sci-fi films from his youth and is even using technology to emulate things like barrel distortion and lens flare. With the footage I saw and with the explanation behind Stanton's inspiration, I really do believe that Wall-E might take over the number one spot in my all time favorites list. Being that emotional from a five minute scene of Wall-E flying through space really goes to show not only how much of an impact the elements of this movie have on me, but more importantly, how well made, how well thought out, and how full of heart the entire movie really is. If you're not excited yet, then I certainly hope you will be by the summer. Once you see the same relationship story between Wall-E and Eve that I saw, you'll be hooked, too. Wall-E is both written and directed by Pixar's own Andrew Stanton, who wrote and directed A Bug's Life and Finding Nemo. The film will hit theaters everywhere this summer on June 27th. Stanton was Co-Director on "A Bugs Life." The Director was John Lasseter. And Stanton Co-directed "Finding Nemo," with Lee Unkrich. Even IMBD knows this. Thank you so much for the wonderful review! I cannot wait to see it too! Tucker, you are correct that he was only the co-director on "A Bug's Life," but he WAS the director on "Finding Nemo." Wouldn't have cared to correct, but the irony of your antagonism MADE me do it. Tucker, IMDB is the Wikipedia of film sites. Once on the Spider-Man 3 page, Rosemary Harris was listed as playing Aunt May/Carnage. Nuff Said. 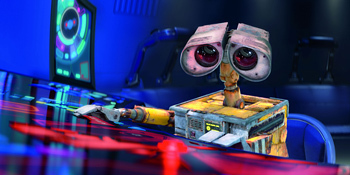 "Wall-E isn't an action movie or a sci-fi flick, it's really just a simple love story." Of course WALL-E is a sci-fi flick! Just because they use the relationship of WALL-E and EVE to drive the story doesn't mean the film doesn't address the same types of issues of gender, mechanization and shape that other science fiction films do. You also make it sound as if Sci-fi films don't use love themes. Good REVIEW though.